Over the years I’ve completed a wide range of commissions. Customers are often uncertain of what exactly they would like me to create, if you’ve got the seed of an idea then please do get in touch. All commissions begin with a chat over a cup of tea… whilst it’s great to meet in person more often this takes place via skype or phone. At this early stage there is no obligation to go ahead. 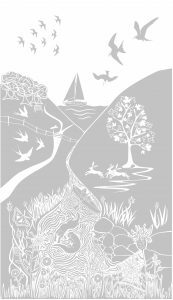 Commissions have ranged from one off sandcast scenes depicting a specific location or event, to a group of twenty variations on a theme. I’ve created an award which was presented at our local secondary school, and a dozen awards which were presented in the House of Commons. I’ve etched a wine glass with a portrait of the customer’s pet, and designed and etched a large complex scene onto a double glazed window panel. No matter how big or small your idea, do get in touch to find out what’s possible. Commissioning art can seem daunting, but I promise I won’t bite! In the example shown here I began by visiting the client’s Devon home. The commission was to be a gift to themselves to celebrate their ruby wedding anniversary. They were keen to show me the marina view that they now had time to enjoy together, having recently retired. The garden area set their home apart from the neighbours, with luscious vibrant plants in large pots: They explained that this had been a project that they had enjoyed working on together. My eye was caught by a pair of garden loungers, and these became the focus point of the design, with the angle of the seats suggesting a companionable conversation. One thing that I emphasise from the beginning of every molten glass commission is the need to ‘go with the flow’ of the glass. I can create the most detailed plans and wire models, but these are then encased between two layers of molten glass, at which point I relinquish control until the piece emerges from the kiln. Even after years of developing this process I am frequently surprised by the outcome. The final colour of the wirework is particularly unpredictable; the copper can vary from shiny gold to brown, or even bright red. With this piece being for a ruby wedding anniversary the client was keen for it to include some red, but they understood that it was a case of keeping fingers crossed! Sadly the first attempt emerged from the kiln cracked in two, but a second attempt a couple of weeks later survived cooling, plus came out with lovely red highlights. With any commission I set an eight week turnaround from agreeing on a design, to the client receiving the piece. In an ideal world I can send it out early, but it’s best to factor in extra time in case it doesn’t quite work out. Some clients like to come along to see the hot glass process, others prefer to wait to see the finished surprise! I enjoy working to commission as it stretches me artistically, introducing me to new imagery and themes that I might not otherwise have considered. This commission is the perfect example of one which also stretched me technically… resulting in a stunning final piece (even if I say so myself!). I received an email asking whether it would be possible to etch a window. Having only etched small pieces of glassware this hooked me straight away! The customer had a professional glazier measure the window and supply toughened sheet glass to regulation standards. 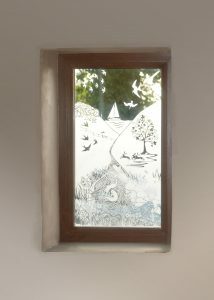 I then sandblasted the design onto the glass, before returning it to the glazier who turned it into a double-glazed unit. 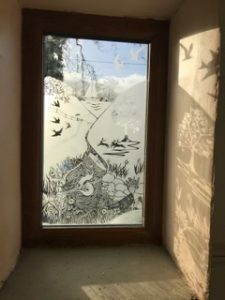 The customer now has a semi-obscured bathroom window with a fun, whimsical and personal artwork.